What if I told you that you could get a Monte Cristo, a stack of doughnut french toast, a boozy milkshake, AND take a picture with a Big Boy lookalike, all under one roof? BE RIGHT BACK, I’M JUST PENCILING IN BRUNCH AT HADLEY’S FOR THE NEXT 52 SATURDAYS AND SUNDAYS. First off, there’s the monte cristo: smoked ham and turkey with Swiss cheese on brioche, BATTERED AND FRIED. Then there’s the doughnut french toast (YES I SAID DOUGHNUT). It’s a stack of cake donuts, battered and griddled, then topped with candied bacon and Miligan’s bourbon barrel aged maple syrup. Oh, and did I mention the boozy shakes? When the #cbusfoodbloggers visited for brunch, our favorites included the oreo bonanza and the Chocolate raspberry swirl with Smirnoff raspberry vodka, raspberry sorbet, vanilla ice cream, and dark chocolate chunks. Dairy not your thing? NO WORRIES. Hadley’s also has a vegan cocoa coffee shake with Crimson Cup nitro cold brew and coconut vegan ice cream! Speaking of vegan offerings, every Monday, Hadley’s offers up a special vegan menu! BUT LET’S GET BACK TO BRUNCH, GUYS. There’s shrimp and grits with stone ground cheddar grits in a creole tomato sauce. 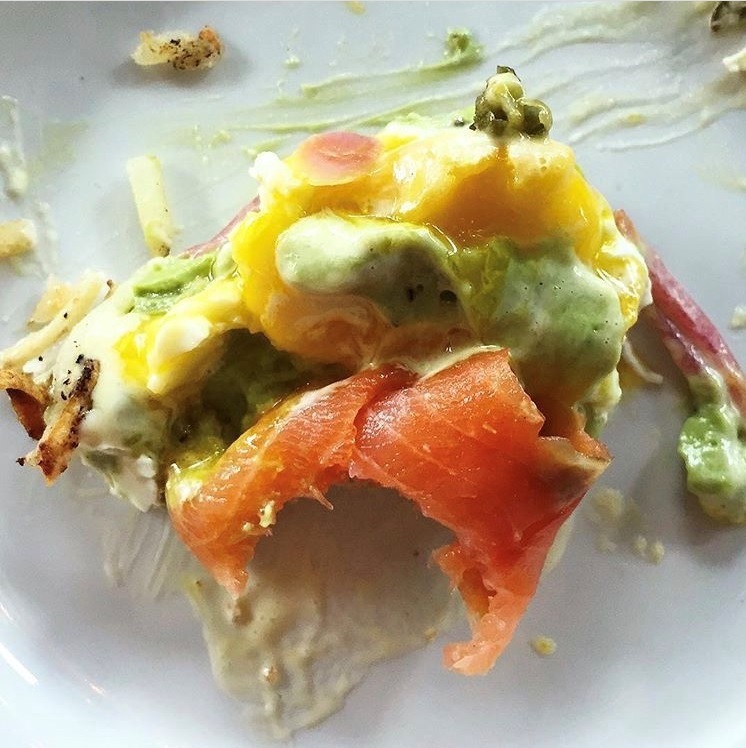 Multi-grain avocado toast with smoked salmon, served with optional soft egg and hollandaise. Nothin basic bout this toast. PLUS Chilaquiles! Crispy corn tortillas baked in a spicy tomato salsa with porky belly or chicken topped with queso fresco, crema, and sunny side egg! Sooo…. Who’s in for brunch at Hadley’s this weekend? PLUS Saturday and Sunday they have bottomless mimosas and champagne special 11-3pm. WHAT ARE YOU WAITING FOR? Happy hour 3-6pm mon-fri with $1 oysters, 1/2 off all drinks, and 1/2 off select apps. I kind of love that you pulled photos that everyone took at the event for this post! And their brunch is killer, cannot wait to go back.